If you are looking for information on the Value Forward Management Consulting franchise business opportunity, Value Forward Consulting franchises or Value Forward franchising , then you have come to the right place. Are you a professional sales, marketing or corporate executive that wants to utilize your skills by working for yourself? If so, we offer you a proven business-to-business management consulting and CEO advisement program that will allow you to help executives and businesses while taking control of your future. Since 2001, we have been working with global 1000 players, family-run businesses, business start-ups and established mid-tier companies, seeking to increase corporate revenue. We currently have 28 management consulting partners in 4 countries. As we continue our expansion, we are seeking a limited number of sales and marketing orientated professionals, former VP of Sales, VPs of Marketing and CEOs, entrepreneurs, and established consulting companies, both domestically and internationally, who want to license our copyrighted programs as business performance improvement specialists. This affordable opportunity requires low overhead, and does not charge royalties. CEO Coaching, Business Consulting and Team Training are a Growth Opportunity! Today, CEOs and their management teams are aggressively seeking outside help to drive their business growth to greater levels. Outsourcing is booming and through our tested analysis tools, lead generation programs and client engagement programs, you can help them succeed both professionally and personally. Differentiators ... What Makes Us Industry leaders? Our program is unusual in that we integrate financial management, sales, marketing, and strategy advisement into one outbound revenue capture program and advise senior management teams n how to grow this business using our copyrighted approach. 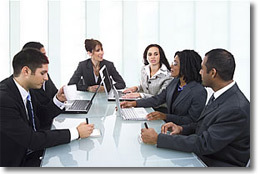 As a coaching company, we advise CEOs and train and support VPs of Sales and VPs of Marketing. This broad range of profit centers gives the licensee multiple profit centers to sell. By helping companies increase their sales and marketing effectiveness, position their corporate strategy correctly, and train their staff, you build a business that you can be proud of. Most coaching programs today work with small, low revenue generating clients that have minimum funding for outside management help. But at Value Forward Consulting, we work with companies that have annual revenues from USD $2 million to $300 million and generate larger client coaching, consulting, training and longer term retainer fees. We are the largest CEO coaching company in the United States that focuses on working in the Small to Medium businesses (SMB) market. Through our CEO coaching and management advisement services you become more than just a management consultant or a trainer -- you become a trusted advisor to executives and are seen as a peer, instead of as a vendor. A Turnkey, Affordable License System with No Royalty Fees Ever!